Monolithic activated carbon (MAC) has been produced from steam activation of monoliths prepared by mixing coal powders with high-temperature coal tar binder for a long time. However, this process leads to poor working conditions, environmental pollution, and waste of resource. 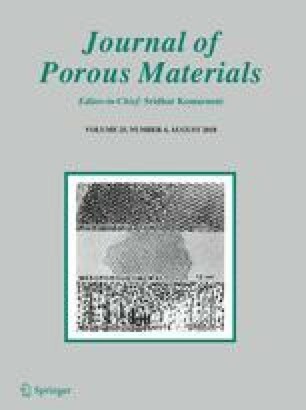 This study investigated the use of coal tar pitch as binder to prepare MAC with high surface area, micro-pore structures, and strong mechanical strength. The performances of the MACs with both coal tar and coal tar pitch as binders were compared. The product yield of MAC bonded with coal tar pitch (MACp) was 10% higher than that with coal tar (MACT). The BET surface area, micropore volume, and average pore diameter of MACP were 837.99 m2 g−1, 0.346 m3 g−1, and 1.776 nm, respectively, which were all superior to the corresponding values of MACT. Only the attrition resistance strength of MACP was slightly lower than that of the MACT. The SEM images showed that the cokes on the surface of both MACs distributed identically and uniformly. Furthermore, XRD results revealed that the pore-expanding reactions mainly led to the reduction of carbon crystallite along with the stacking direction rather than horizontal direction during steam activation process. This work demonstrates that cost-effective MAC can be prepared with the coal tar pitch as binder and the results of the investigation presented in this work provide new and important information necessary to the successful application of MACs in industrial field. The authors gratefully acknowledge the financial support from the National Natural Science Foundation of China (Grant Nos. 21576293 and 21576294).